The 15th IEEE/IFIP Network Operations and Management Symposium (NOMS 2016) will be held between 25-29 April 2016 at Istanbul Technical University, Suleyman Demirel Cultural Center, Istanbul, Turkey. 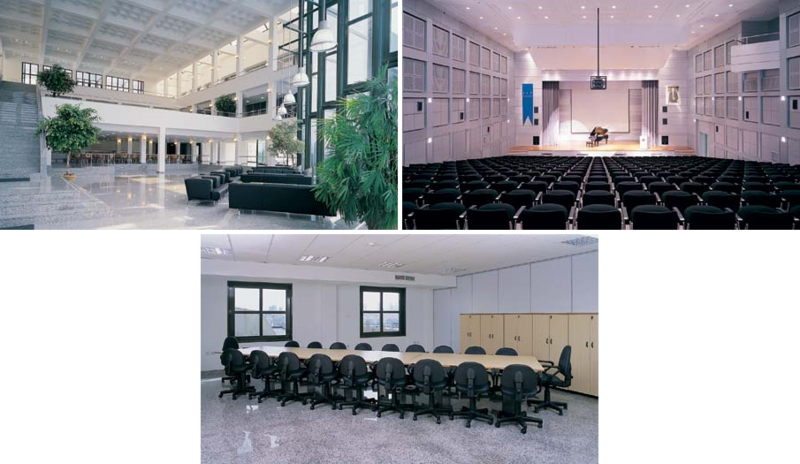 A Conference Hall, operating in 650 m2 area with a seating capacity of 460. A Meeting Room, operating in 270 m2 area with a seating capacity of 80. 4 Workshop Rooms, operating in 52 m2 area each with seating capacities of 30. An Atrium, operating in 350 m2 area, suitable for exhibition, reception, concert organizations. Cafe-Patisserie also serves in the Atrium with a seating capacity of 100. An Executive Bar, operating in 270 m2 with a seating capacity of 60. A Restaurant, operating in 420 m2 with a seating capacity of 200. Suggested hotels with discounted rates are provided by a tourism agency in Istanbul. Please visit the agency website for further details on accommodation and tours. Ayazaga Campus can be accessed by metro via M2 (Yenikapı-Hacıosman) line. İTÜ-Ayazağa station is near the campus entrance. The campus is also accessible by driving through the main two highways O-2 and O-1 passing Fatih Sultan Mehmet and Bogazici (Bosphorus) Bridges respectively. Ample parking space is available on campus. M2 line directly connects the campus to the city center (Taksim). In addition, it is possible to transfer to M1 line at Yenikapı station to access Atatürk Airport. For more information, please check Istanbul Railway Network Map and Istanbul Card Website (Istanbul card is necessary to take metro, bus, tram or ferry). Havataş is an airport bus service which connects both airports in Istanbul to central locations including Taksim and Yenikapı. For more information including service hours and prices, please visit their website. Estimated taxi fares are listed below. SDKM is in 2 minute walking distance to the main campus entrance. In campus map, item 31 (in A3) indicates the SDKM building. There is also a fun comic campus map.